As I've stated before, I don't really buy that these projects don't affect the tuition price. The "sizeable pledges" could be geared towards operations & not to big vanity projects. It gives us great pleasure to announce that the Yavneh Board of Directors have approved a building renovation, beginning with a complete modernization of the Early Childhood Wing. Further phases of the project include an expansion of the parking lot, with up to 82 additional parking spaces, and the creation of a 1,000 square foot Atrium. This Atrium will create a more suitable entrance to our school, with a welcome center and a multi-purpose area. We hope to begin construction on the parking lot this fall, with the goal of building the Atrium next summer. At Yavneh, our core belief is in “affordable excellence”. This project is being undertaken with the goal of creating a state of the art facility for our children, while keeping a close eye on managing our expenses. As of now, there is no plan to incur any debt for this project. We have been fortunate to lower tuition the past two years and we hope to be able to continue this trend going forward. It is with this in mind that we are creating a capital campaign, to ensure the affordability of Yavneh tuition for years to come. We have already received several sizeable pledges which will help get this project off the ground, but we do need your support to reach our goals while keeping tuition in check. In the coming weeks we will formally introduce our capital campaign and strongly encourage all who are able to participate. 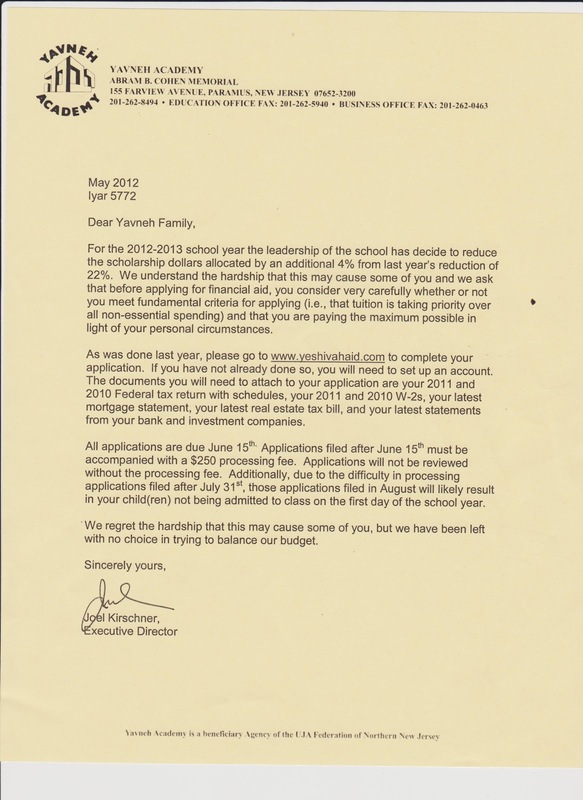 Yavneh sent out a letter announcing that they had to cut their scholarship allocation for the 2nd year in a row and telling parents who want to apply to submit their documents to www.yeshivaaid.com. We should all realize that when we call for schools to freeze or lower tuition it often means that those who can least afford it have to sacrifice a little more. But the fact of the matter is that very few of us can afford any increases. Other schools are considering deferring some obligations rather than simply writing them off, in the hopes that some parents will be able to make the payments in the future when they are in better financial situations. That's also a good idea though I doubt too many parents will make those payments in the future especially if their kids graduate before their situations improve. While asking for all of this documentation (W-2's, mortgage statements, etc.) is necessary, I think the schools really need to visit the houses of the people applying. Papers don't always tell the whole story. They should see how people are actually living. I think for the amount of money we are talking about its worth the investment in manpower. Looks like He'atid hired some teachers after all! We are excited to inform you that we held our first professional development session for Yeshivat He'Atid teachers this past Monday evening. Part of the training also included Rebecca Tomasini, from the Alvo Institute, to begin instruction on our blended learning model. We believe we have put together an amazing faculty consisting of experienced, devoted and enthusiastic teachers who understand differentiated instruction and 21st century learning. Our teachers believe in Yeshivat He'Atid's mission to transform Jewish education and our commitment to being a cost effective institution. We are well on our way to a fantastic school year this September! You can view pictures from the evening by clicking the link below. Separately, we wanted to allay some of the concerns shared by Teaneck parents regarding busing. We are in close contact with Teaneck Public Schools. Currently, our bus route is still out to bid. The process is taking additional time because we are a completely new route. We have been told by Teaneck that they expect to hear back from the bus company within the next month. Please be assured, if the bus route is not picked up, Teaneck residents will be entitled to compensation from the town which can then be used towards private bus service. We will share additional information as soon as we receive it. Please feel free to contact either one of us with any questions or concerns you may have. A reader sent me the calculation below for the Goldbergs attending YNJ. They haven't posted 2012-2013 tuition on their website yet (nor has Yavneh for some reason) so I'll assume his numbers are correct. ...they have announced that fees will be unchanged except for the reduction in early childhood fees previously announced. I would project 2012-2013 at $38,230. The 2011-2012 total is $38,930 and the pre-k tuition has been reduced from $9,200 to $8,500 in 2012-2013. The other fees should be the same, although they may still increase lunch. We all love to complain about high tuition, high property taxes, etc. Now's our chance to actually try and help our situation. It's going to be a close one and in the rain the turnout will probably be low. If you don't know how to vote, please ask around or read the candidates statements online and decide for yourselves which ones seem concerned with issues that affect the YDS community. We asked the candidates to respond to some questions about these issues and got responses from Barbara Toffler and Alexander Rashin. Polls open 6am-8pm. Please check your polling location (some of them changed recently) by going to the Division of Elections website. Click on the picture above to see it bigger. As Gershon promised, there will be school on Erev Shavuot and Election Day. I've never heard a good explanation why either of those should be days off. Teacher training is BEFORE school starts not in the middle of the year. & no more early dismissals for parent-teacher conferences either the day before or after. All told its 178 school days which is more than any of the existing JDS's but still 2 days less than the public schools. We just need to put in 2 days of Chol Hamoed Succot & we'll be there! Impressive that they are able to have more days while still keeping the costs way down. Hope they can keep it up! Solomon Schechter easily wins first prize at a whopping $55,800! Still waiting on Moriah, RYNJ and JFS to publish their schedules. If anyone has them please send them to me. Of course if He'atid makes good on its commitment to keep prices constant (just adjusting for inflation), in 2016 a "Goldberg" family would be paying $25,970 in 2012 dollars. I don't know whether you put length limits on answers. I'll try to be brief but will include extra explanations that I feel necessary. I would appreciate if you publish them in full to avoid a distorted picture. If you would find necessary to cut something, get back to me to clarify possible misinterpretations. I'll start with a general statement and then insert my answers to individual questions in your text below. You are right: it is not a municipal election topic especially when school elections are moved to November and the BOE budget is out of taxpayers' control. However, you have a right to know my general views on education. Because you apparently are religious (which is your 1st Amendment right) I'll sometimes invoke religious terms in my answers. The only justification for any system of education is giving the best possible education to every Teaneck child. The primary judge of what is the best for your child - are you. However, as a religious person, you might understand that every given to us bit of true knowledge about the immense Creation carries a message from the Creator. Therefore you need to provide your child with the best currently available factual knowledge about the world we live in and about ourselves. And you should not ban any best knowledge revealed by the Creator about his work. Rambam tells in the Guide to the Perplexed that one cannot serve G-d best if he does not know physics. And physics cannot be understood without mathematics. And now here comes molecular biology etc. These revelations do not stop, which I can attest to as a working scientist. Kids differ in their ability to master these subjects. Here come computerized objective testing whether they learned their best. If they did - your primary judgment was correct and keep trusting your primary judgment. If not - consult someone you trust, and try something else. 1. Courtesy bussing for private schools. Do you favor keeping it even in times of fiscal austerity? Answer: it's not "courtesy" - each Teaneck child has the same right to equally adequate services. If in bad times cuts come - they should be equal for all. Answer: I do not see why not. Luckily we do not have a government monopoly on educating (and often brainwashing) children. Public (and private) schools can compete by providing the same virtual education as an option. Answer: Absolutely fine with me - you have a right to choose, many choices - are good, and competition can increase quality and reduce costs. Answer: I do. There is one problem, most Teaneck residents do not realize. Residents, who send their children to private schools significantly reduce property taxes on the entire Teaneck population. If they all would send their children to Teaneck public schools, we would need more school buildings, more teachers, more supplies. That would require large additional taxes. Therefore as it is (acknowledging a very high financial burden on private school parents) we all should be heartily grateful to the private school parents (one member of BOE agreed with this assessment; another objected that more kids in public schools is alike a mass production that would decrease costs. As if kids are mass produced cheap TVs). Universal introduction of vouchers would dramatically change the situation and could be sustainable (not bankrupting taxpayers) only if each voucher is significantly less costly than the full current price of education per student. Still such smaller vouchers might shrink public schools with their exorbitant costs per student (and therefore associated taxes) and partially alleviate the double burden on private school parents. Answer: I would support it if it will not bankrupt the State or its taxpaying population, and if there is a system of checks that technology is used effectively. I taught at schools where kids mainly played games on school provided computers or pulled them apart.